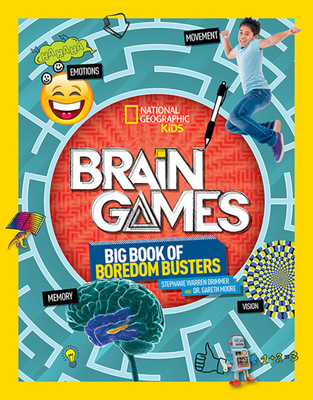 Packed with science, puzzles, and tons of fun, this activity book based on the hit National Geographic television show will fire up your neural network! Calling all fans of the Brain Games TV show! Excercise your mental muscle with awesome challenges, wacky logic puzzles, optical illusions, and brain-busting riddles. Write-in pages include both games and short explanations of the neuroscience at work. Have fun and challenge yourself as you unleash your inner creativity and become the genius we all know you are. STEPHANIE WARREN DRIMMER writes about biology, technology, and outer space. Her work has appeared in Popular Science, Popular Mechanics, National Geographic Kids magazine, and Scholastic's Super Science and Science World magazines. Drimmer is a graduate of New York University's Science, Health and Environmental Reporting Program. She is an expert at imparting scientific information at a level that is both fun and understandable for a kid audience and is the author of both Mastermind and Brain Bogglers. Puzzle creator DR. GARETH MOORE is the author of over 35 best-selling international puzzle and brain-training titles from a wide range of publishers. He is the creator of "Brained Up" (www.BrainedUp.com), a cutting-edge brain-training site, offering scientifically designed daily sessions.